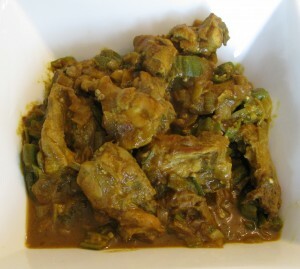 If you’re a fan of Okra and have not yet thought about combining it with Chicken, give it a shot. You can’t go wrong! Spices: 1 tsp turmeric, 1 tsp chilli powder, 1 heaped tsp cumin, 1 heaped tsp coriander, 1 level tsp of curry powder, and 1 tsp salt. (If you like it spicier, simply add a touch more of each spice to taste. With Bangladeshi cooking, nothing is set in stone)! 1. Wash and clean the chicken and if using breast pieces only, cut into large pieces about 2-3 inches long. If using the whole chicken, make sure it is cut into medium sized pieces. Remove all skin ( I usually have the butcher remove it beforehand). 2. Heat the oil until nice and hot. Add diced onion and fry for a minute or two until the onion starts to brown. 3. Add 4-5 cloves of whole garlic and fry along with the onion. 4. Add the spices as above and fry for 2 minutes to allow the spices to blend well. 5. Keep some hot water on hand from the kettle and add as necessary to form the massala sauce (bhuna). 6. Once you have enough massala, add the chicken. Put the heat on high and allow to cook until the chicken browns all over (10-12 minutes if using a whole chicken, 6-8 minutes if using just chicken breast). Add water as necessary if you start to see the massala drying up. 7. Add the okra and let cook for a minute or two on high heat before putting the lid, lowering the heat and allowing to cook for a further 5-7 minutes until all ingredients are fully cooked. Be careful not to overcook the okra as the dish will get mushy. 8. Remove from heat when done and the sauce is the consistency that you want it. Generally, “bhuna” is a dry dish, but some people like a little more sauce with their rice.